Everyone’s been so focused on how much Khalil Mack has impacted the Chicago Bears this year. And rightly so. But somehow, the greatest defensive player of this generation, Aaron Donald, isn’t being talked about nearly enough. What Donald is doing this season is nothing short of legendary. This is a defensive tackle who leads the league in sacks with 16.5 through 12 games. The next-best total in the NFL? Von Miller has 12.5 sacks, and he’s an edge-rusher whose quickness outside knows no equal. Even more jarring is the fact that Donald was working himself into football shape the first three games of the season (following a prolonged holdout over his contract) and didn’t log a single sack until Week 4. So, this dude has racked up 16.5 sacks…in the past nine games. Even better, he’s made his mark when the Rams have needed a big play the most. As noted by Andrew Ortenberg of Rams Wire, Donald has 10.5 sacks in the six games Los Angeles has played that were decided by seven points or fewer. 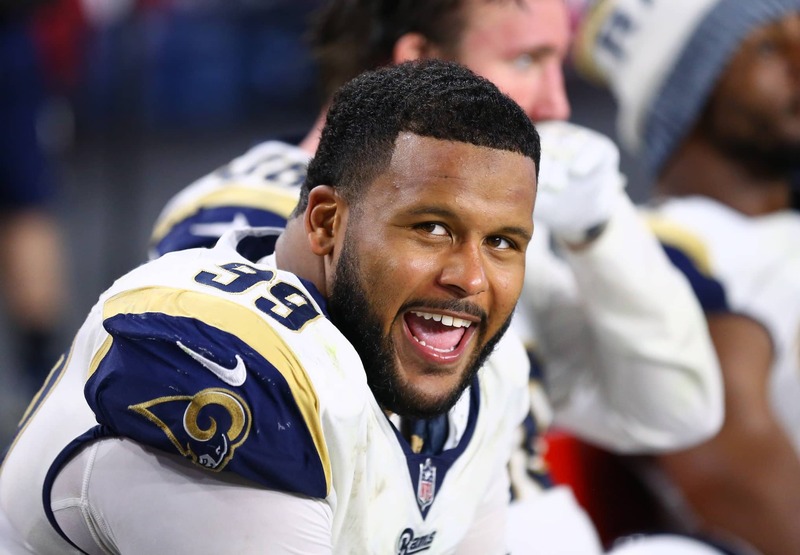 Here's the thing about Aaron Donald/MVP: So many of his sacks/big plays/forced turnovers came when the #Rams deperately needed a play to be made. The defensive star came up huge for the Rams on Sunday on the road in Detroit. It was Donald’s forced fumble on his second sack of Matthew Stafford that turned the tide of that game — a game the Rams ended up winning by two touchdowns. He cannot be blocked by one man, and quite often two offensive linemen fail miserably, too. Donald, with four games remaining, has a legitimate chance to break the NFL’s all-time record of 22.5 sacks in a single season, previously set by Michael Strahan back in 2001. If he keeps up with his current pace of just under two per game in his last nine, he’ll be right there. Regardless, he’s almost sure to beat the all-time record for most sacks in a single season by a defensive tackle, which is currently 18, set by Keith Millard back in 1989. It’s not just about the sacks, either. This man is a dynamo in the run game, more often making plays behind the line of scrimmage than he does in front of it. We’re watching history in the making, ladies and gentlemen. We’re witnessing one of the all-time greats unfurling his majestic wings, and it’s just glorious.